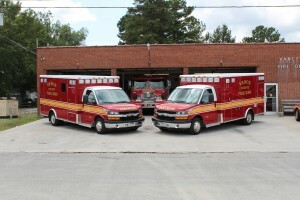 Provide quality and efficient Fire and EMS services to the citizens of Vance County. We are committed to preserving life and property through rapid emergency response through Fire prevention, Fire suppression, Code Enforcement and Emergency Medical Services. Vance County Emergency Services is a combination department, providing Fire and EMS Services to the citizens of Vance County. Our department responds to approximately 6,000 EMS calls and 1,000 Fire related incidents within Vance County and the City of Henderson on a annual basis. Our department covers approximately 254 square miles. Emergency Services has 28 full time employees, 25 part-time employees and 10 volunteers. The department operates 5 fire apparatus and 3 EMS units continuously on a twenty-four hour basis out of two stations. One of our EMS unit is located in the Bearpond Fire Department which covers the southern part of the County.